Response to Trion World's MMO Rift has been overwhelming, with the 17 servers allocated to North America for last week's head start blossoming into 39 to combat long login queues. The game launches tomorrow, with more servers on the way. 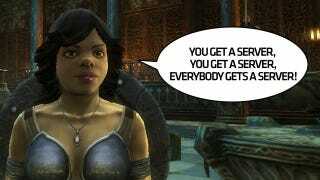 My Dwarven warrior Oprah might be exaggerating a little, but not much. Since the Friday launch of Rift's head start program, 22 new servers have been added to the North American side of the game in order to keep players playing. As I wandered about the world of Telara on Saturday, new server messages popped up on my screen, followed by the failure of anyone playing to log off of the one they were playing to give the new one a try. People like the servers they are on. Queues have been worst in the evenings, and best during the morning. As of this posting I can log on to my preferred server readily, but last night I spent three hours waiting in line to play for one hour. The queues have cause many players to resort to away-from-keyboard tricks to stay connected while not playing. Trion has already patched the game to keep one such trick from working. And this is only the head start. The full game goes live tomorrow for non-head start players, and considering the word-of-mouth the game has been generating (I'd recommend checking it out), the servers should be swamped. A Trion Worlds representative told Kotaku that more servers would be opened to accommodate the new players, but that shouldn't do much to ease the pain of players on more popular shards, like my own player-versus-player role-playing realm of Sunrest. My suggestion to head start players? Brace yourselves, and never, ever log off.